A Washington State lawmaker has called for the firing of Olympia’s police chief, following statements made by the law enforcement official in 2016 in relation to protests over supply chain shipments of materials used in oil and gas production in the West. 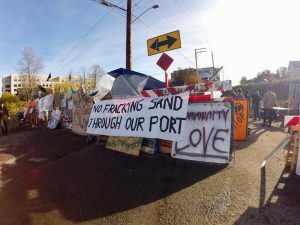 For the second year, protesters blockading railroad tracks near the Port of Olympia, Washington have failed to stop shipments of sand, or ceramic proppants, headed to Western states for use in the hydraulic fracturing process for oil and gas development. The protesters of Olympia Stand have previously opposed the shipments of fracking sand to North Dakota, as they did in 2016, to show solidarity with the Dakota Access Pipeline protests, as well as this year’s deliveries to Wyoming. “NO FRACKING SAND THROUGH OUR PORT,” read one sign at the blockade’s camp. Signs also included references to the Antifa protest movement, featured as Olympia Stand’s Facebook profile picture. But it’s a statement delivered during last year’s protests by Olympia Police Chief Ronnie Roberts that’s drawing renewed interest by Washington State Sen. Doug Ericksen (R-Whatcom County). The former chairman and ranking member on the Senate Energy, Environment and Technology Committee told Western Wire, which obtained a full video and transcript of the statement, that Chief Roberts “should be fired” or at the very least resign, based on the “off the charts” comments he shared with the Olympic City Council in November 2016 during the previous protest. “I don’t want to be a part of this. And I don’t want my department to be the scapegoat for the decisions that the port is making. They have choices and options, should they choose to use them, to eliminate proppants coming to the port,” Roberts told the Olympia City Council. “Continued shipments will only erode more trust and put more people and businesses in our community at risk. If the port has to accept any cargo, then price your service out of the market so vendors can go someplace else where it’s more accepting,” Roberts said. The police chief said he doesn’t agree with the contents of the shipments that he believes puts him and his staff in a difficult position. Roberts even sympathized with the protesters’ tactics. “I understand these actions are based on fear and a sense of hopelessness in a system where they can’t make change. When people don’t trust the process, they will resort to other processes that can be more destructive and harmful overall,” Roberts said. Ericksen didn’t pull any punches after a review of Roberts’ full statement. “He doesn’t have the ability or the authority to make those decisions. He needs to resign immediately, because now he’s compromised,” Ericksen said. Roberts and the Olympia Police Department did not respond to Western Wire by deadline. “It’s incredibly frustrating that a police chief thinks that he can selectively enforce the law based on his own personal beliefs about a legal activity within the Port of Olympia,” Ericksen said. “His job is to enforce the law,” Ericksen said. The Port of Olympia’s contract with Rainbow Ceramics must be honored, according to spokeswoman Jennie Foglia-Jones. “We can’t really pick and choose the cargo if we have the facilities and equipment to handle it,” Foglia-Jones said. The port must also follow federal regulations, including the Commerce Clause and the Tariff and Trade Act of 1984, Foglia-Jones told the Olympian. Ericksen said that while the number of protesters was small, the cleanup was “lengthy” and substantial according to law enforcement, similar to protests such as those last year in North Dakota. Olympia Police said police dogs were used to search for possible explosives in the area once the camp was emptied of approximately 20 to 30 remaining protesters in the early morning hours on Wednesday. 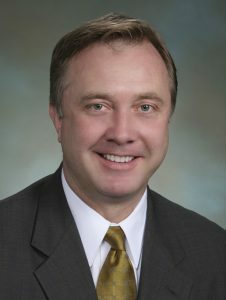 Economic disruption, according to Ericksen, should be an enhanced crime for those who “block legal activities of commerce” including blocking highways and railroad tracks. Ericksen’s bill also targeted national sponsoring groups and funders, naming California billionaire Tom Steyer’s Washington activism as an example. Todd Myers, Environment Director for the Washington Policy Center, said the protests were not unusual for Olympia or activists from nearby Evergreen State College, where ongoing protests by social justice activists have produced rancor on the campus for the past year. And Roberts’ comment, delivered while in uniform before the city’s political class, Myers said, gives the protesters some level of cover. “What he’s saying is, ‘if we don’t get our way, then violence is understandable.’ That’s a police officer saying that. A police officer is saying, ‘if we don’t get our way, then violence is understandable.’ They’re supposed to be the ones that say no, violence is never acceptable in democracy,” Myers said. Councilmember Jeannine Roe continues to oppose the transportation of the fracking sand. “If you continue to have fracking sands coming into the port, then there will continue to be protests,” Roe said. Another protester, identified as “Reed Wing,” pulled down a green ski mask and told the city council that as a representative of Mars, he was speaking in solidarity with Olympia Stand. “I come as a representative of the United Federation of Mars, an ecological and utopian society where we have abolished fossil fuels, police, and the exploitation of one Martian by another,” Wing said. “Good evening Mayor and Council. I’d like to take a few moments and just share a few comments, thoughts that are on my mind. I am struggling to understand why the port is not aligned with our community values we hold so dear. I care about our climate, our environment, and the impact of products being moved through our community for the sake of money. I do not agree with the confrontational behavior with police who are simply trying to protect the entire community. I understand these actions are based on fear and a sense of hopelessness in a system where they can’t make change. When people don’t trust the process, they will resort to other processes that can be more destructive and harmful overall. We are all facing uncertainty and are concerned where the country may be going. I am focusing on love and compassion for our community, and a desire to be a steward of the land god gave us so that it is available for all of our children and our grandchildren. I don’t want to be a part of this. And I don’t want my department to be the scapegoat for the decisions that the port is making. They have choices and options, should they choose to use them, to eliminate proppants coming to the port. Continued shipments will only erode more trust and put more people and businesses in our community at risk. If the port has to accept any cargo, then price your service out of the market so vendors can go someplace else where it’s more accepting. I’ve spent the last five years empowering our department to build trust and to build relationships with our community. I don’t want to lose these efforts. It angers me to have to put our officers in combat gear and face off with members in our community over something I don’t believe in myself. The port has put me between a rock and a hard spot, and I don’t want to be a part of it. But I don’t get a choice to not protect our community; it is the mandate for police. I implore the port to look for options and solutions that are compatible with our community values which have been so clearly stated by council.